The combination of asparagus, spring onions, cherry tomatoes, and a creamy mushroom soup gives this warm meal a nice colours, fantastic flavours, and even better nutrients. 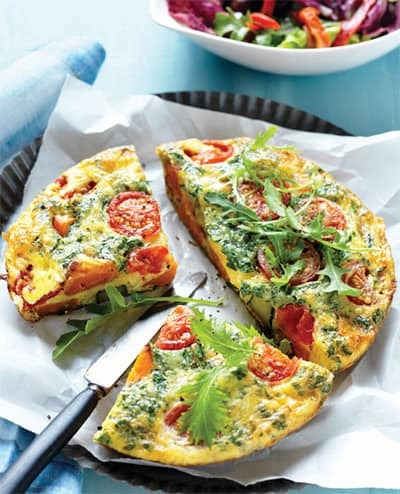 Eggs contribute with a good amount of proteins which helps our body feel full for hours and that’s especially good for all of those trying to lose some weight and improve their health. Prepare this Italian classic today and enjoy! Combine all ingredients except the asparagus and tomatoes. Pour into a flan dish lined with Gladbake. Arrange the steamed asparagus and halved tomatoes on the top and bake at 180C for 30-35 minutes or until set.